Swarup Bhunia, Ph.D., has been named as Director of the Institute and the Sachio Semmoto Professor. Swarup Bhunia, Ph.D., has been named as Director of the Institute and the Sachio Semmoto Professor. Dr. Bhunia is a professor in the Department of Electrical and Computer Engineering (ECE) at the University of Florida. Dr. Bhunia received his Ph.D. from Purdue University and was an Associate Professor at Case Western Reserve University before coming to UF in July 2015. Dr. Bhunia has over 20 years of research experience, with over 250 publications in peer-reviewed journals. He is also the author or editor of 10 educational/reference books in the area of VLSI design, CAD and test techniques. Dr. Bhunia is a senior member of IEEE and serves as associate editor of three IEEE publications. He is also the founding editor-in-chief of the Journal of Hardware and Systems Security (HaSS) and associate editor of the Journal of Low Power Electronics (JOLPE) and the Journal of Electronic Testing: Theory and Applications (JETTA). Hardware and systems security, food and medicine safety, adaptive and energy-efficient computing, and wearable and implantable systems are among his research interests. 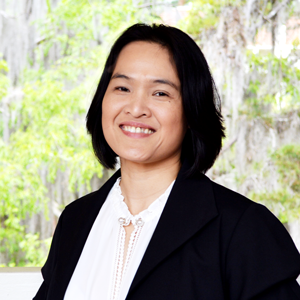 My T. Thai, Ph.D., a UF Research Foundation Professor, has been selected as the Associate Director of the Institute. 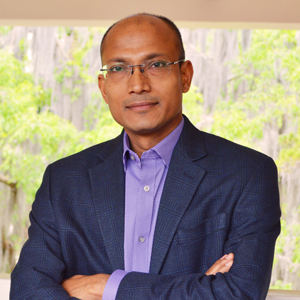 My T. Thai, Ph.D., a UF Research Foundation Professor, has been selected as the Associate Director of the Institute. Dr. Thai was previously the Associate Chair of Research in the Department of Computer & Information Science & Engineering (CISE). She received her Ph.D. from the University of Minnesota, Twin Cities in 2005; and she has been on the faculty of the Herbert Wertheim College of Engineering since 2006, receiving $6 million in grants over that time. Dr. Thai received an early career award from the National Science Foundation (NSF) for 2010-2015 and a young investigator award from the Defense Threat Reduction Agency (DTRA) for 2009-2014. She has authored or co-authored more than 250 research papers and received the 2014 IEEE MSN Best Paper Award and the 2017 ICDM Best Papers Award. Her research interests include many areas that touch on the connected world, including blockchain, scalable machine learning, security and privacy, big graph mining, complex network analysis, approximation algorithms and optimization. “This is a tremendous opportunity, and there are so many great things we can do at the Institute. I’m looking forward to working with my colleagues to smartly connect everything in a meaningful way – to improve quality of life and to generate the best workforce in the IoT-related areas,” Dr. Thai said. In her role as Associate Director, Dr. Thai will coordinate Institute strategy, research, education, and training as she helps to raise the visibility of the Institute nationally. Cammy R. Abernathy, Ph.D., Dean of the Herbert Wertheim College of Engineering is certain of the role that UF can play in this transformational period in our history. 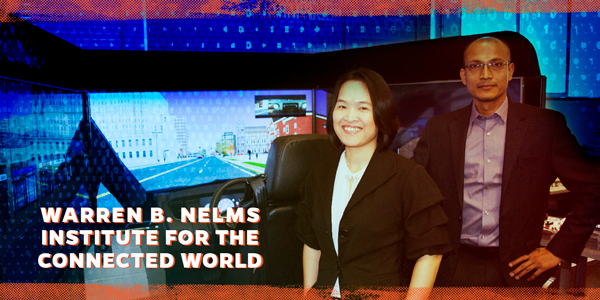 The Warren B. Nelms Institute for the Connected World was established in April 2017 to lead research and education in all aspects of the intelligent connection of things, processes, people, and data that address major world challenges including health, energy, transportation, and manufacturing. Together with industry, university, and government partners, the Institute will develop broad, interdisciplinary Internet of Things (IoT) technologies, applications, and policies to create more secure and connected communities. To fuel the next industrial revolution, the Institute will promote tech transfer, entrepreneurship, policy, education and outreach in IoT and its integral components of sensors, low-power embedded processing, communication, networking, cloud computing, data analytics, machine learning, security, privacy and trust. The Institute is named in honor of Department of Electrical and Computer Engineering (ECE) alumnus Warren B. Nelms, a New Engineer who built his own solar “smart” house where he raised his children, who both went on to become UF engineers as well. His son and daughter-in-law, David and Daryl Nelms, have honored him by generously investing $5 million to help create this institute. “My vision for the Warren B. Nelms Institute for the Connected World is that UF will become one of the leading places anywhere for educating the best and brightest engineers to securely connect all the world’s devices,” said David Nelms, former chairman and CEO of Discover Financial Services. Dr. Sachio Semmoto, Japanese telecommunications mogul and ECE alumnus, was instrumental in helping establish the Institute. His $1.5 million gift established an endowed professorship, the Semmoto Professorship, to support research in IoT and ultimately led to the vision for the creation of an IoT themed institute.